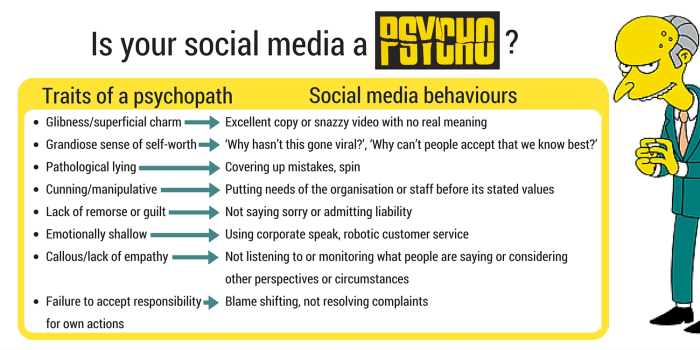 For those of us working using social media, it’s telling to see that some behaviours we classify as being ‘standard communications ‘techniques’, in fact mimic the behaviours of a person with an anti-social personality disorder. Is that how we want to represent our organisation? I think it’s useful to check ourselves every now and then – is this social media or corporate media? It’s not so odd to suggest that an organisation, or discipline, displays these characteristics. I recently re-read Will Black’s book ‘Psychopathic Cultures and Toxic Empires’ and one of the main arguments he makes is that the practices, processes and habits in an organisation can be completely dysfunctional because of the legacy of charismatic, exploitative and powerful psychopaths who have previously been in charge. Indeed, research shows that CEOs can be inclined towards these traits with 1 in 25 business leaders possibly being psychopaths.